As a master impressionist and a man of many characters from his “Saturday Night Live” days and beyond, Dana Carvey, one of the keynote speakers at NADA Show 2019, has had to wear many hats, so to speak. So too does the franchised car dealer. Just as Carvey’s repertoire has ranged from characters like “Garth Algar” and “The Church Lady” to impressions of Ross Perot, Johnny Carson and everyone in between, dealerships must navigate a slew of fields from finance, service and repair, reputation management, online retail, social media and, of course, the selling of new and used vehicles. While perhaps Carvey may have a few impressions and characters in store for his speech at the show, NADA also has workshops and sessions lined up at its annual convention, set for Jan 24-27 in San Francisco, to help dealers work through the many roles they play. Part of that will be through a new feature at NADA Show 2019: a preview of the NADA Professional Series, the association’s new dealership management training program. “Attendees will see first-hand why dealership managers are looking to this program to supercharge their careers,” NADA said on its convention website. Topping that list of challenges, Gilchrist said in an emailed Q&A with Auto Remarketing, is the struggle around new-vehicle affordability. “It’s a huge issue. And we as an industry need to work on keeping these vehicles affordable for our customers. Affordability is everything for our customers, and so it will be a big part of everything we do at NADA,” Gilchrist said, as he prepares to take the helm of the association, which hosts its NADA Show 2019 convention this week in San Francisco. Gilchrist, of Texas-based Gilchrist Automotive, was the 2018 vice chairman of NADA. Chosen be the vice chairman for next year is Rhett Ricart, of Ohio’s Ricart Automotive Group. Asked what targets he would like NADA and the franchised dealer community to focus on in 2019, Gilchrist said: “The main thing that I want to do as chairman is to get every dealer involved in NADA. Of course, the challenges — and subsequent opportunities — don’t end with new-car affordability. “We’re also facing a critical shortage of service technicians in the auto retail industry. We have to find the best people for every position in our dealerships, but we don’t have nearly enough service technicians now, let alone in the coming years when tens of thousands more will be retiring,” Gilchrist said in the Q&A, after his point on affordability. “That is an enormous challenge, and we’ll be talking much more about that at the 2019 show and in the months ahead. Our workforce is our absolute best asset, but it’s aging, and we have to recruit, train and retain the best people if we want to continue providing our customers with the best experience,” he said. Regarding the latter point on tech, some dealers and dealer groups have partnered with and/or invested in some of the tech-driven companies aiming to change the retail model. For instance, AutoNation was the lead investor in an $146 million funding round for online car retailer Vroom, which officially announced the Series G round in December. AutoNation had announced its piece of the investment in late October, saying it obtained roughly a 7-percent ownership stake in Vroom after a $50 million strategic investment in the online car retailer. In the vehicle subscription space, AutoNation announced a partnership in November with used-car subscription provider Fair to potentially provide the dealer group’s customers “an alternative to traditional ownership” and drive used-car velocity. Elsewhere, the list of dealers working with subscription service providers is quite extensive. So, what is driving the decisions by the groups to work with these tech-driven companies aiming to change retail? But like his predecessor, 2018 NADA chair Wes Lutz, Gilchrist also urges caution and thoughtfulness around some of the discussion of certain topics in mobility and vehicle tech. In a speech to the Automotive Press Association in October, Lutz, while emphasizing his fondness for auto reporters, urged them to challenge some of the specific “narratives” around mobility and the supposed “end” of personal car ownership. “I get it. You can’t go to an automotive or a tech conference these days without hearing about the end of personal vehicle ownership,” Lutz said in the remarks later provided by NADA and summarized in a news release. So, Auto Remarketing posed this one to Gilchrist: What are some of the narratives that he would ask media folks like us to question? “Absolutely. There are three main media narratives right now regarding the future of our industry that might sound right, but that in reality are built on false or unproven pretenses, and those are: that ride-hailing will replace personal vehicle ownership; that self-driving vehicles will be immeasurably safer than human drivers; and that dealers are reluctant to sell electric vehicles,” Gilchrist said. “For example, the idea that ride-hailing will replace personal vehicle ownership has always been built on the premise that it’s a cheaper alternative to owning your own car or truck. At least that was always what we were told by proponents of ride-hailing and these companies themselves,” he said. “But last year, the AAA Foundation for Traffic Safety released a study finding that the cost of relying on ride-hailing services as a primary mode of transportation in 20 of the biggest metro areas in the U.S. was, at minimum, more than twice as much as the cost of owning a personal vehicle. That statistic should be front and center in this conversation,” Gilchrist said. “Similarly, the argument that self-driving vehicles will be safer than humans is built on the premise that humans aren’t good drivers. But there are 90 million miles driven in the U.S. for every motor vehicle death,” he continued. “That’s 342 years of driving — 24 hours a day, seven days a week, 52 weeks a year — between traffic deaths. Humans are in fact phenomenal drivers,” Gilchrist said. Elsewhere in the Q&A, we touched on the pre-owned side of the market, where Gilchrist said he believes the momentum will remain. Many publicly traded dealer groups are putting a big emphasis on used cars, including standalone used-car stores. Certified pre-owned sales, for instance, continue to be a strong resource for car dealers. “I think all dealers, because of the margins in the new-vehicle departments depressing, are searching for additional revenue sources,” Gilchrist said. Holman Automotive has added a Jaguar franchise to its existing Land Rover San Diego facility, selling and servicing new and pre-owned Jaguar vehicles. In other dealer news, Chapman Volkswagen in Philadelphia has created a new blog to help customers learn more about the latest Volkswagen models and local events. Land Rover San Diego is now operating as an authorized Jaguar dealership and is currently in the process of transitioning all Jaguar sales and service operations to its facility at 9455 Clayton Drive, San Diego. With the addition of Jaguar to its Land Rover San Diego location, Holman Automotive now includes 37 dealership franchises representing 18 brands from the East Coast to the Pacific Northwest. Jaguar Land Rover notes that it has engaged in an “aggressive product expansion” throughout the United States, including Land Rover’s return of its Defender model to the U.S. market. For Jaguar, its 2018 expansion includes the E-PACE compact performance crossover along with the brand’s first-ever, all-electric, mid-size performance SUV, the I-PACE. In additional dealer news in Philadelphia, Chapman Volkswagen has created a new blog that features several articles detailing the standard and available features of the available models at the dealership as well as other important information that drivers may also enjoy. Articles have covered models such as the 2019 Volkswagen Jetta and the 2019 Volkswagen Atlas. In addition to links and images to show drivers what the vehicles look on the outside as well as on the inside, the posts also include details on local events. The blog posts also offer information about the dealership’s inventory, service department and other services. Those interested in the blog can go to chapmansvw.com and visit the “About Us” section. Car buyers are doing more advance research than ever. Because of that, they often know more about the dealership than the dealership knows about them. Connect Automotive Intelligence is a new product that VinSolutions believes will close that gap. VinSolutions notes in a press release that Connect Automotive Intelligence will help dealers better act on customer engagement and data. The tools will analyze customer communications and behaviors to help dealers find the best opportunities to deliver a more personalized experience. 1. Engagement strength, which measures a salesperson’s interactions with an existing prospect or customer. By tracking a salesperson’s customer interaction frequency, the tool highlights engagement trends and helps managers better visualize how a salesperson is performing in the CRM. 2. Sentiment analysis, which uses artificial intelligence to determine customer sentiment and intent by analyzing text messages and emails. This analysis helps identify revenue opportunities and highlight the customer interactions that will build satisfaction. 3. Buying Signals, which captures and analyzes shoppers’ online behaviors and distills them to predict shopping personas, shopping preferences and the sense of urgency. Rather than leads coming into the CRM without any context of the prior online shopping behavior, this new enhancement uses known online traffic to increase speed of sale and build trust with the shopper. For new technologies like artificial intelligence to be most effective, VINSolutions says technology integrations must also take place. As part of Cox Automotive, Connect Automotive Intelligence works with products from its sister companies, including Autotrader, Kelley Blue Book, vAuto, Dealer.com and Xtime, to streamline workflows, reduce duplicate data entry and ensure dealers get more value from their software investments. Those integrations, which help improve personalization across the entire consumer lifecycle, will also be filtered through these artificial intelligence-enabled enhancements to bring the most opportunity out of the marketplace for dealers. Connect Automotive Intelligence will be available to view at the NADA convention later this month in San Francisco. Jaguar St. Petersburg and Land Rover St. Petersburg is the newest member of the Crown Automotive Group, and the newly constructed, 19,000-square-foot building includes various new design features. The dealer group noted the grand opening of the St. Petersburg, Fla.-based dealership will be the first Jaguar Land Rover “Arch” architectural design used in Florida. The arch is a worldwide design used to express the advanced technology of these brands. The new dealership was scheduled to open its doors on Tuesday and features 11,500 square feet of new construction, a showroom with 16-foot-high ceilings, and 100-percent LED lighting. The new home for Jaguar St. Petersburg and Land Rover St. Petersburg also is one of the first buildings to have a hurricane-resistant, seamless glass system with exterior glazing — which the group noted is designed for a “luxuriously open feel” while withstanding Florida’s often inclement weather. “We are extremely excited to have such iconic British brands added to our lineup. Especially one which compliments Jaguar, a marque we have represented since 1976,” Jim Myers, president and chief operating officer of Crown Automotive Group, said in a news release. The grand opening of Jaguar St. Petersburg and Land Rover St. Petersburg also featured a service reception area and a fully air-conditioned service shop. More than 3,000 square feet of the service area, including the shop, includes all-new equipment for its certified technicians. Also, three new service lanes with quick-check capabilities have been installed. The company notes that the lanes increase the speed and information gained from service by using laser sensors and cameras to check wheel alignment, tread and other readings in seconds. “Our goal is to make our customers’ experience very memorable every time we have the pleasure of interacting; thus showing why we are the truly the better way to buy,” said Michal Niezbecki, general manager of Jaguar and Land Rover of St. Petersburg. The Dave Cantin Group (DCG) sought to become the fastest-growing and largest automotive mergers and acquisitions firm in the United States during 2018. And DCG believes it delivered on that vision based on the results the company reported this week. DCG completed 2018 with 39 acquisition listings valued at more than $1.5 billion. 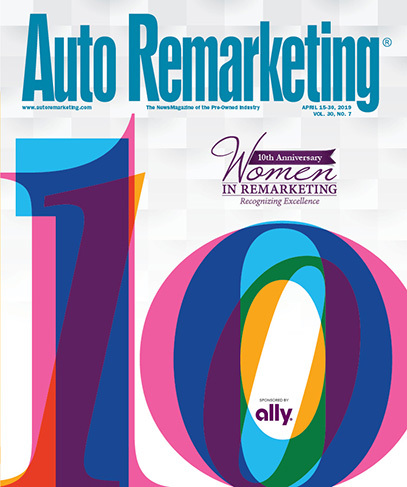 The listings cover more than 18 automotive brands, including Audi, Cadillac, Mercedes-Benz, BMW, Jaguar, Land Rover and Infiniti. Cantin said that DCG’s 2019 goals include offering more than 50 acquisition listings with a valuation of more than $2 billion. The company is expanding its team in 2019, seeking to add additional M&A experts in all five regional offices and its headquarters in New York, to handle the volume of activity and interest in working with DCG. DCG will exhibit at the upcoming National Automobile Dealers Association Show beginning on Jan. 25 at the Moscone Center in San Francisco. The firm’s space will be at No. 7553W, located in the center’s West Hall on Level 2. Sheehy Auto Stores has announced donations of $135,000 among 19 charities throughout the communities they serve in Washington, D.C., Baltimore and Richmond, Va. The donations are part of Sheehy’s Annual Giving Program whereby each dealership partners with local non-profit organizations. AutoNation chief operating officer Lance Iserman and chief technology officer Tom Conophy will be leaving the company effective Monday as part of an operational structure reorganization announced by the retailer, a restructuring that involves several executives departing the company and a change in its regional structure. As part of the realignment, Donna Parlapiano — who is the executive vice president of franchise network, mergers and acquisition, and corporate real estate — chose to retire effective Jan. 3. Chief human resources officer Dennis Berger will leave AutoNation on Jan. 31 after assisting in the transition. In a news release, AutoNation chief executive Mike Jackson said: “We believe automotive retail will be challenging in 2019 and improving our performance, creating synergies across our network, and restructuring our corporate and regional teams are pivotal components of AutoNation's cost savings plan, as we create a more agile, streamlined, and efficient core business that is well-positioned for long-term success. “These actions will better position us for a changing market,” Jackson said. The reorganization also includes a consolidation of AutoNation’s regional structure from three regions to two. In conjunction with the reorganization, AutoNation named James Bender its executive vice president of sales, a move that was effective Tuesday. Bender, who was been with AutoNation for more than 20 years, was most recently the Eastern region vice president. “Jim is an exceptional and respected leader, with tremendous success. He will lead all aspects of the variable sales operations,” Jackson said. CarMax’s used-vehicle unit sales in its fiscal third quarter were down 1.2 percent against comparable stores in the year-ago period. But pre-tax earnings and earnings per share for the retailer were up, something president chief executive Bill Nash called a “testament to the strength of our diversified business model,” in a news release recapping CarMax’s quarterly performance for the period ending Nov. 30. In a summary of the quarterly results, which were announced on Dec. 21, CarMax said pulled in net sales and operating revenue of $4.30 billion in its Q3, a 4.6-percent year-over-year gain. Net earnings were at $190.3 million, up 27.9 percent. Net earnings per diluted share came in at $1.09, up 34.6 percent. Continuing on with some of the highlights of the period, CarMax increased its total used vehicle unit sales by 2.3 percent, moving 173,476 cars for the quarter. The aforementioned dip in comparable store used unit sales was due largely to softer store traffic, a trend partially balanced by better conversion. Elsewhere, CarMax saw a 10-percent hike in total wholesale unit sales, as it moved 110,403 of these vehicles for the quarter. Income for the CarMax Auto Finance unit came in at $109.7 million, a 6.7-percent uptick. “We are pleased to report solid growth in both pretax earnings and earnings per share, despite having soft comparable store used unit sales this quarter,” Nash, the CEO, said in a news release. “This is a testament to the strength of our diversified business model. “We are also excited to introduce our omni-channel experience in Atlanta, where consumers can now customize their car buying experience, whether they want to buy a car completely from home, in-store or, most importantly, through a seamlessly integrated combination of online and in-store experiences,” he said. That initial launch of the new CarMax buying experience in Atlanta was announced on Dec. 4. CarMax said at the time it plans on eventually making it available nationally to most customers by early 2020. “We’re delivering on an unmet customer need for a car buying experience that is flexible, convenient, and fully personalized, with the ability for customers to get help when and how they want,” Nash said in a news release when the omni-channel experience was announced. Through the omni-channel offering, consumers are able to conduct their entire purchase from home — taking care of things like finance, appraisal and paperwork without going to the store. CarMax will deliver to home or work and lets the consumer test-drive before the purchase is complete. Customers are not required to buy before the car is delivered. They can also choose to utilize the in-store pickup after completing the majority of the deal online. Shoppers can reserve a car for seven days; and if they buy, they can return it within seven days for a full refund.